Several 2d animators and story(board) artists have been reporting exciting results with the upgraded “Grease Pencil” annotation tool in Blender. What started as a quick way to add notes in the viewport has now grown into a powerful animation tool for sketching storyboards — and even final animations. 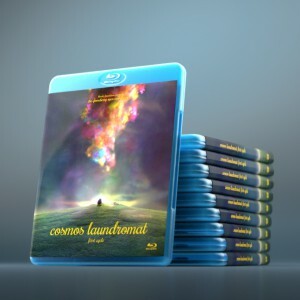 Matias Mendiola, who worked here on Cosmos Laundromat storyboarding in September, posted the video below. He could do this minute of film in just half a day. No tedious .jpg file naming and saving, loading, texture mapping, and video editing needed! It uses a single .blend file as starting point for the scene, avoiding the use of paper, scans, and other software. It combines the storyboard and animatic in the same work session, making the process much faster. Backgrounds and character drawings can be reused for different shots and scenes. Allows the director to work on scene timing from the very beginning. Allows the director to use the same (or multiple) camera angles and movements that will be used later in production. Download the .blend file here (3 MB). Needs Blender 2.73 to work! Very interesting ! This feature is far from anecdotic, it’s come a good way towards bridging the gap between 2D and 3D, very promising .. It’s already a big speedup for preprod, but if could probably be used to produce final animations ..
Once again, kudos to the dev team ! This will be very helpful to add detail to my non photorealistic renders for http://the.amorzorzores.com ! keep pushing blender beyond his limit guys !! Sooner or later, I knew that Blender would come around to being used a boarding tool. Now I’m waiting for somebody to use Blender as a 3D boarding tool. Because that is the future of storyboarding. Bravo, Pratik! You’re ahead of the game. Well, Wikipedia doesn’t always get it right. I had a number of friends who worked on that show and from what I understand Proof did the pre-vis and they use Maya. I have recently been reminded that Blender was used as a pre-vis tool on Spiderman 2. Matter of fact, I’ve seen the footage. I believe that Anthony Zierhut used the particle simulator to create a helicopter crashing into a bridge. However, I think Wayback Machine misquotes Anthony by suggesting that he was using Blender to storyboard Spiderman 2. 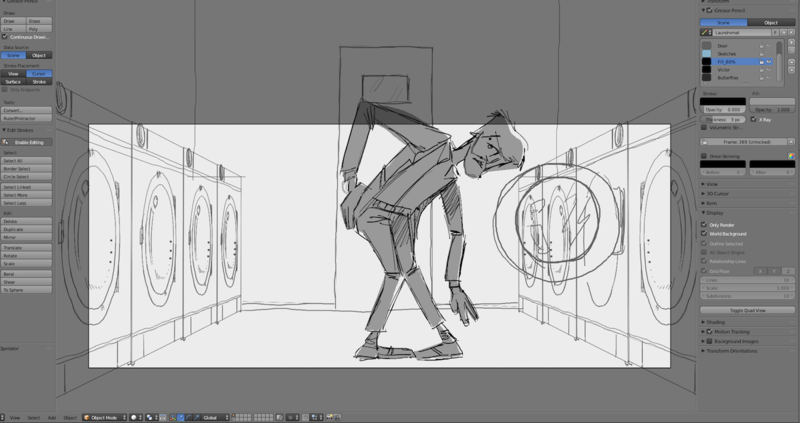 As far as I know, neither Blender nor Maya have ever been used to storyboard a major US motion picture. That is why I think what Matias has done is very forward thinking. Previz is indeed a different topic. What Matias does is sketching in 3d, using all the fancy benefits of having Blender’s viewport, and yet have all the creative freedom of a storyboard artist! How can I render the animation? By the screen cast option or is there a better way? You can render the viewport both as a still shot, and as an animation. There is a button for both in the 3d view port. One looks line a camera, the other looks like a clapper board. Or you can google ‘blender viewport render’ and look in the wiki. Why does grease pencil need a different kind of render to render? Why doesn’t it render normally?